Put all the hype aside and the experts will tell you that social media marketing is all about engagement and content. Social media marketing works when you WORK it. 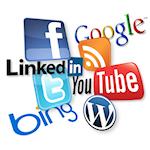 Think of social media marketing, whether it be Facebook, Twitter, or Google+, as an ongoing process of digitally building relationships and communicating effectively with the people who follow you. Thinking that social media is one of the primary sales tools for your business is a huge mistake (and won’t work that way! ).